First thing is first, no matter what changes you want to make to your body by either losing weight or improving your fitness, remember that motherhood is no walk in the park and you are amazing already! Most of us want to shed a few pounds and lose weight quickly to have more energy and feel more confident but trying to find time for yourself is not easy. Mom life is BUSY! And sometimes it can feel like we have no time left in the day to take care of ourselves after taking care of everyone else. HOWEVER, I believe that kids can be our greatest motivation to workout. It teaches them the importance of being healthy and active through our actions. As challenging as it seems to stay active, exercise provides the mental clarity and physical energy needed to keep up with our busy schedules. Even just 10 minutes a day can have a huge impact on not only your waistline but also your stress and energy levels! 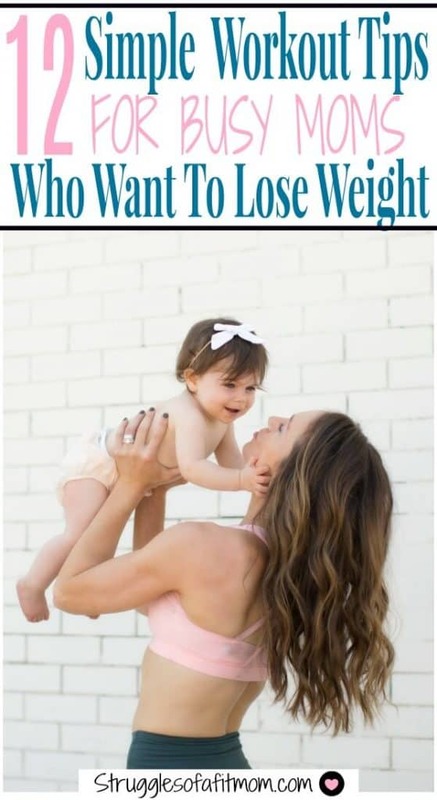 I want to share with you my top 12 tips for finding time to lose weight as a busy mom to help simplify your weight loss goals and help you find just 10 minutes a day for yourself because you deserve it, mama! But first, I want you to know that I totally get your struggles with finding time for your fitness and weight loss goals. Being a “Fit Mom” seems impossible and unrealistic with everything else we juggle in a day. However, it is possible to maintain your health and fitness goals, I promise! Prior to having babies I was honestly very concerned with how I was going to get my workouts in after my daughter was born. The mental benefits of exercise such as reducing stress, anxiety and boosting energy play a crucial role in my life. Sure, I also want to be confident in my own body. You doesn’t? But feeling our best is what helps to look our best! After the birth of my first baby, I quickly realized that my intentions for working out had to change. I no longer had the freedom and flexibility to workout whenever I wanted. My mindset, intentions and effort had to change. 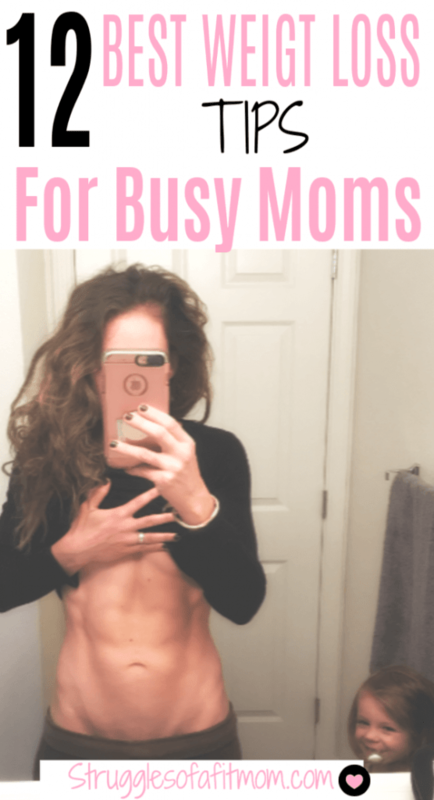 So, here my tips to help get you moving in right direction and make those weight loss and fitness goals a priority AND reality… even as a busy mom. In order to reach my fitness and weight loss goals as a new mom, I had to sharpen my multitasking and creativity skills to squeeze in workouts whenever given the opportunity. I am always mentally prepared to bust out some 4 minute calorie blasting Tabata or even some Pelvic Floor Recovery exercises. Like you, I couldn’t see how short, 5-10 minute workouts were going to help me reach my weight loss and fitness goals after having a baby. However, I quickly realized that EVERY LITTLE BIT COUNTS! Ill say it again, I never thought such short, sporadic workouts would help me quickly lose baby weight and get back in shape. It is so easy to get caught up in the mindset that in order to see results, you must workout for hours a week. While I do believe that higher intensity workouts are essential to losing weight and building muscle, squeezing in small bouts of exercise will also help you reach your weight loss goals. Think of it as “extra credit” to you more structured workouts. Not only will you burn extra calories, but 5-10 minute workouts can give you the mood and energy boost you need to tackle on your day. Working out first thing in the morning is not always easy. Especially when you are exhausted or have a baby who doesn’t sleep well at night. However, getting your workout done and over with is much better than skipping it and having the frustration of wanting to workout hanging over you for the rest of your day. Our days are filled with a million commitments and obligations that popup and it’s very easy for something to interfere with your gym time. Knocking it out before the day gets away from you will help provide the energy, mental clarity and even give you the mood boosting satisfaction of crossing off one item on your to-do list. You’re finished before the kids wake up so you won’t feel guilty taking time away from them for yourself. I am admittedly not a morning person so morning workouts were a tough transition. Waking up while its still dark outside takes a lot of will power. I recently gave up on using my phone as an alarm clock because its too easy to hit the snooze button. Instead, I place a sunset simulating alarm clock across the room. When its time to get up, light and one of five nature sounds gradually increases to wake my husband and I. This is way better than having a sudden and loud alarm clock on my phone startling me out of bed. By placing it away from the bed, it also forces me to get up and turn it off which makes it less likely for us to go back to bed. Finding time to workout is one thing. Finding motivation to figure out what to do for a workout is another. If you only have 30 minutes to exercise, it can take that long just to figure out what to do which sabotages your entire workout. Once you have juggled your schedule to squeeze in a workout, make sure you have a game plan for what you will do to sweat. In order to see the best results from your workouts, have your workout planned. Push yourself to get as much done and as quickly as possible which will rev up the intensity and speed results. Intensity drives results, not time! This is one element that sets apart those who see results quickly and those who don’t. The results you see are not from how much time you spend exercising. They come from HOW you spend that time exercising! Amping up the intensity of your workouts is going to give you much better results than working out longer. In fact, the harder the workout, the shorter your workouts will be because sustaining high intensity for too long is almost impossible. Another benefit of increasing the intensity is that you can still see amazing results by working out fewer days of the week. Fit moms don’t spend hours in the gym. They workout hard and maximize every minute they have. This is also why having a plan (See #3) before starting your workout is so important. It prevents you from getting distracted and maintain a calorie touching intensity. Regular exercisers don’t have extra time to workout, they make time. Most of us have unused chunks of time in our busy schedules to squeeze in a quick 15 minute interval workout. Take some time to audit your schedule and see what can be rearranged to free up a few hours each week to exercise. I’ve been pretty obsessed with my 360 Happy Planner. It is super cute and multifunctional and when things are cute, they are more motivating to use! They have a huge variety of motivational stickers and embellishments which makes planning your schedule much more fun. It makes a great fitness tracker because it has places where you can paste progress pictures, document workouts and also meal planning. There are many times when squeezing in a 30-45 minute workout is impossible. However, you can still reap the benefits of burning calories, toning muscle, boosting energy and reducing stress by breaking up your workouts into a few 10-15 minute sessions spread throughout the day. And remember, something is ALWAYS better than nothing, even if it is just a quick 4-minute Tabata workout. This is my absolute favorite tip! Kids learn more from what we do than what we say. Including them in your workouts not only teaches them to live an active and healthy lifestyle but it is also a great way to bond with them. The guilt of taking time away from our kids to do things for ourselves often holds us back from exercising enough. However, we need the energy to keep up with them and working out can give you just that! Kids are born to be wild! They naturally love running, exploring, and learning new skills and tricks. One of the easiest and most fun tips to lose weight is to be active with your kids. It has become too easy to entertain children with TV and video games rather than being active. I totally get it, playing catch or going for a bike ride after a long, stressful day at work can seem like the last thing you want to do. But it is also the number one most important thing for the health and happiness of both you and your children. Your kids want you to being active with them. So instead of sitting on the sidelines, run around and chase them, ride bikes together, and go on hikes to explore. These activities also help you to burn a lot of calories and can even help you shed some pounds. 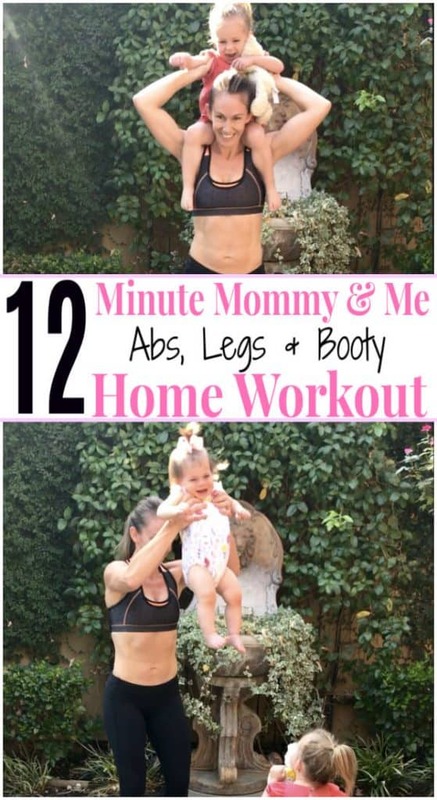 If your little ones are still babies, hold them while you do some squats or lunges. If they are older, play a game of “tag” at the park or do some burpees while they play in the backyard. You dont need a gym or even your house to burn calories. Use those creativity skills us mamas were gifted with and get moving anytime, anywhere. Instead of using your lunch hour to zone out on Social Media, pack some tennis shoes and go for a walk or do a little office cubical circuit training. Resistance bands are a cheap and excellent piece of equipment you can bring with you just about anywhere to help you lose weight and tone up. The park is also an excellent place to squeeze in a quick workout while the kids run around and release their energy. Just make sure you are keeping an eye on them so they don’t wonder too far. If the gym is intimidating, here are some tips to help conquer your fears of a gym setting. Remember that awesome planner I mentioned earlier? After you finish planning out your schedule, shift gears for a minute to acknowledge how many things you juggle on any given day, hour or minute just to make sure everyone and everything is taken care of. If you can’t see it, I’ll be the one to tell you that YOU ARE BUSY! Kids are unpredictable and Mom life is even more unpredictable. As hard as we try to maintain routine, it is inevitable that something will always throw us for a loop. Be patient with yourself when you are struggling to get your workouts in or staying on track with your diet. Don’t beat yourself up for eating an extra slice of pizza or two bowls of your kids cereal at midnight (guilty as charged). It is all part of the journey and noone is perfect. Consistency is the most important element to success. Instead of throwing in the towel after a few bad days or weeks, pick up where you let off and keep going. Giving up on our goals only teaches our children that it is okay to stop trying when things get a little challenging. Remember, they watch and learn from our actions more than our words. As you know, moms are excellent multitaskers. This is truly a gift because sometimes squeezing in a little workout requires some creativity and multitasking. If you have 10 minutes to kill while waiting to pick up your kids from school, do some squats in the parking lot or take a brisk walk up and down the street. Try throwing in some squats while cooking dinner or giving the kids a bath. Finding motivation and staying committed to reaching your health and fitness goals is not easy. Without the proper support, being successful in those goals is almost impossible. Losing weight and staying fit as a busy mom requires a lot of support. Share your goals with your spouse, family and friends so they can help keep you motivated when you feel like giving up. Join a support group on Facebook with like minded people to encourage and motivate each other. Having workout buddies is another great way to stay commited to your goals. If you commit yourself to meeting friends at the gym or a group exercise class, you will be less likely to cancel and skip your workout. If you find it challenging for people to understand your goals, don’t back down or give up. Taking care of your body and mind through exercise and healthy habits is the best thing you can do for yourself. Join the Take-10 Workout Challenge for quick, effective workouts and the support, motivation and success you’ve been missing in your journey! Diet plays the biggest role in reaching your weight loss and fitness goals. Unfortunately, this is also the hardest part. Many have the mindset that they can exercise extra hard to burn off extra calories consumed. Wouldnt that be nice? I hate to break it to you but it doesn’t work that way. The good news is that we have more control over what we eat than how much we can workout. I know what you’re thinking, it doesn’t always seem like it after we just stuffed our faces with an entire box of Girl Scout Cookies. However, I can promise you that you will see greater results from mindful eating than you will from spending obscene amounts of time exercising. Small changes such as not snacking off your kids plates at meal time or while cooking dinner can add up to huge weight loss results. Be mindful of what you’re eating instead of mindlessly munching and you’ll be surprised the results you see. If you track calories, be sure to track all the little nibbles of food you eat too, those calories count and can make or break weight loss results. These are a few small tricks and tips that can add up to huge results and make being a “fit mom” a reality instead of dream. What tips and tricks do you use to stay active and healthy as a busy mama? Join me on Facebook or Instagram for more tips, tricks and workout ideas. So true, those 5-5 mins are so precious for mom’s…I do try to get those 5 mins for my workout, better than nothing at all……. Thats right! 5 mins is better than nothing. Great job, mama! !